Macbeth – Underlings Theatre Co.
Macbeth is presented by Underlings Theatre Co. Written by William Shakespeare. Directed by Daniel Thomas Blackwell. Scenic Design: Zachary A. L. Stern. Lighting Design: Erik Fox. Projection Design: Elizabeth Gove. Costume Design: Evelyn Quinn. Music and Sound Design: Josh Garcia. Fight Director: Lauren Squier. As I said to my friend as we left the venue, it’s just not theater unless it ends with a severed head in a bag. On this, it would seem that William Shakespeare and I are on the same page, at least when it comes to his tragedies (though imagine how a severed head in a bag might liven up the ending of The Comedy of Errors. Oh, the possibilities!). You might find something strangely familiar in the air when attending the Underlings Theatre Co.’s production of Macbeth. That’s by design. 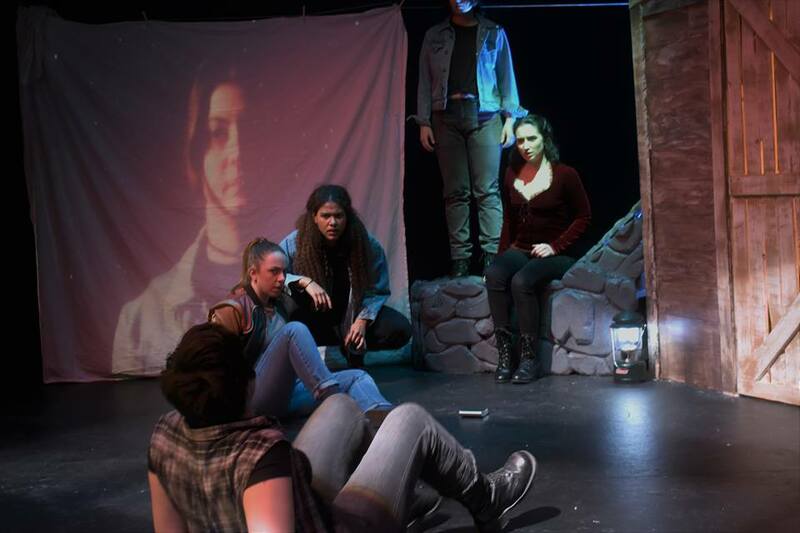 For their fifth (and sadly final in Boston) production, the Underlings have found inspiration for their take on the Bard’s story in a bevy of modern horror movies. There’s a dash of Evil Dead, a smattering of Paranormal Activity, and a whole lot of The Blair Witch Project. To lay my cards on the table, I’ll say that Macbeth has long been my favorite Shakespeare play, so the Underlings probably could have done the show as a staged reading with scripts in hand and I’d have loved the show. My own personal bias aside, though, I still think there’s a lot to recommend this production of Macbeth, not least of all a fantastic lead performance and handful of visuals that tap into the eerie nature of the play. This isn’t my first time seeing a Macbeth that imagined a horror movie framework for its production. One memorable past viewing of the Scottish play placed the action in the middle of a post-apocalyptic wasteland, complete with a horde of rotting zombies. The decisions to do so actually isn’t as haphazard as you might first think and it’s not just because the plot features witches and apparitions. It’s because, more so than in any other of Shakespeare’s plays, the existential questions posed by Macbeth most closely match those that are posed by the horror genre. So much of that genre (movies especially) feature characters wrestling with the threat of forces beyond their control much the way that Macbeth wrestles with the unstoppable and terrifying forces of fate. At the beginning of the play, the weird sisters tell Macbeth exactly how his story will end. The play deals in the horror of succumbing to that fate as what will eventually drive Macbeth mad are his attempts to take control of his destiny. Actually, in the context of the Underlings’ production, I’m making a bit of an error by referring to Macbeth as “he.” Director Daniel Thomas Blackwell makes the choice to cast the show with a female identifying/non-binary cast, changing many of the pronouns in the text from “he/him” to “she/her.” It’s certainly not the first time this has been done, but it’s a choice that opens up a world of possibility for the staging. It places a queer woman right in the center of this story about fate, power, evil and a desperate search for meaning. When Lady Macbeth encourages Macbeth to act like a man and take control of his circumstances, the words now have an added sting. The decision also allows for the show’s biggest asset, the performance of Cassie Foote in the titular role. This isn’t even Foote’s first gender bending Shakespeare performance, having played a fantastic Oberon in one of my favorite productions from last year, Apollinaire Theatre’s A Midsummer’s Night Dream. Here, Foote turns in a rather peculiar performance. She can appear a bit flat in some of the early group scenes, but once the stage is cleared and she’s allowed to sink her teeth in Macbeth’s meatier dialogue, she springs to life in the role. It’s as if she’s holding back at the start, only so that she can let it rip in the play’s latter half. Once she does, she turns in a portrait of a woman driven to destruction by a dash for power. She’s surrounded by a great cast who, in many cases are pulling triple and quadruple duty so that a total of six actresses can portray all of the characters in the show. Overall, the best moments in the show come when director Blackwell is able to synthesize the play with the horror iconography that he’s digging into. Moments like when an otherworldly yellow light pulses under the door to the ramshackle cabin as though an unseen entity is watching on the other side. Or like when Macduff walks, axe in hand, towards the defeated Macbeth with a cruel glint in her eye. I don’t know that these moments come often enough for me to feel like the concept has been properly synthesized with the play, but there’s certainly enough breadcrumbs along the way to hold our attention. The production also gets a fair amount of mileage out of the idea of videotape, a la The Blair Witch Project, even going so far as to opening with a statement that what we’re watching came from tapes found in the woods. I actually think that this is a fascinating idea to work into a show where fate plays such a vital role. If you’re old enough to remember video cassettes (which, yes, I happen to be), you could argue that a narrative caught on videotape is a fixed path, much like that of fate. There are moments when it seems like the staging is starting to play with this idea, like when Macbeth watches the witches’ apparitions on a video camera screen but again, the concept isn’t worked into the staging enough for me to be confident that this isn’t me projecting. There’s devilish fun to be had with Underlings’ production of Macbeth. It’s a solid piece of work by young theatre artists who show that they’re willing to play with the art form. The company will sadly be disbanding after this production, but here’s hoping that the artists that come up after them will follow in mission to bring new stories to the Boston theatre scene. Macbeth is presented by the Underlings Theatre Co April 5-13, 2019 at the Mosesian Center for the Arts.